Preoperative colorectal tumor localization is crucial for appropriate resection and treatment planning. As the localization accuracy of conventional colonoscopy is considered to be low, several localization techniques have been developed. We systematically reviewed the tumor localization error rates of several preoperative endoscopic techniques and synthesized information on risk factors for localization errors and procedure-related adverse events. MEDLINE, EMBASE, the Cochrane Library, and the grey literature were searched. Studies were included if they reported tumor localization errors in patients with colorectal cancer undergoing resection with curative intent. Using random-effects models, pooled incidence of tumor localization errors were derived for conventional colonoscopy and colonoscopic tattooing. Due to the lack of comparative studies, a direct comparison of the pooled estimates was performed. 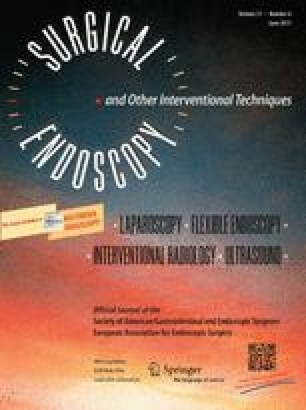 Procedure-related adverse events, risk factors for localization errors, and the localization outcomes of other techniques such as colonoscopic clip placement, radioguided occult colonic lesion identification, and the use of magnetic endoscope imaging were also synthesized. A total of 38 non-randomized controlled and observational studies were included in this review (2578 patients underwent conventional colonoscopy and 643 colonoscopic tattooing). The pooled incidence of localization errors with conventional colonoscopy was 15.4 % (95 % CI 12.0–18.7), whereas that of colonoscopic tattooing was 9.5 % (95 % CI 5.7–13.3), mean difference 5.9 % (95 % CI 0.65–11.14, p = 0.03). Adverse events secondary to tattooing were infrequent, and most were cases of ink spillage. Limited information was available for other localization techniques. Conventional colonoscopy has a higher incidence of localization error compared to colonoscopic tattooing for localization of colorectal cancer. Colonoscopic tattooing is safe and leads to fewer tumor localization errors. Given the widespread adoption of laparoscopic resections for colorectal cancer, routine colonoscopic tattooing should be adopted. However, studies directly comparing different localization techniques are needed. Sergio A. Acuna and Maryam Elmi have contributed equally to this work. The online version of this article (doi: 10.1007/s00464-016-5236-8) contains supplementary material, which is available to authorized users. We would like to thank the Information Specialist, Christine Neilson, at the Scotia Bank Health Sciences Library, Li Ki Shing Knowledge Institute, St. Michael’s Hospital, for performing the search presented in this systematic review. We would also like to thank Dr. Fady Saleh for her help in providing data used in this manuscript. Prakesh Shah is supported by an Applied Research Chair in Reproductive and Child Health Services and Policy Research from the Canadian Institutes of Health Research. Dr. Prakesh Shah is supported by an Applied Research Chair in Reproductive and Child Health Services and Policy Research from the Canadian Institutes of Health Research. Maryam Elmi, Sergio Acuna, Prakesh Shah, Natalie Coburn, and Fayez Quereshy contributed to the study conception and design, analysis and interpretation of data, critical revision, and final approval. Maryam Elmi and Sergio Acuna acquired the data and drafted the manuscript. Sergio A. Acuna, Maryam Elmi, Prakesh S. Shah, Natalie G. Coburn, and Fayez A. Quereshy have no conflicts of interest or financial ties to disclose.